A purist might criticize a game like this for being neither fish nor fowl: It isn't enough of a game for satisfying play, and it requires too much of the audience to succeed as a movie. Sometimes that charge has merit, as in the case with Wing Commander III, where the characters that develop between missions are frequently far more interesting than the missions themselves. The repetitive nature of Wing Commander's mission structure, combined with an engine that never overcame its sense of unreality, means that the cut scenes are the most convincing and engaging element of the game. The unfolding story of Mark Hamill's Col. Blair, stuck aboard a slightly decrepit carrier in the wake of yet another catastrophic setback, is more than a little reminiscent of Battlestar Galactica, and made a decent space simulator into a powerful piece of entertainment. It's just unfortunate that the simulator itself was the weakest part of the experience. But this is only a problem for those with a slavish devotion to classification and forms. The Wing Commander series uses film and gameplay to create an entertainment experience that neither medium could achieve individually. That's all the justification any creative decision should ever require. The best products to emerge from the "interactive movie" period should give you pause about whether or not we've defined "interaction" too narrowly and whether or not we underestimate the degree to which sharply-drawn characters and convincing game worlds lie at the heart of a game's appeal. Again, The Last Express is a key witness in the case against orthodoxy. The Orient Express as imagined by Jordan Mechner and company is a real place, and your fellow passengers are living people. Listening to the different characters talk to one another and assume different roles in relation to one another is not what typically passes for interaction in a videogame, but it is nonetheless profound. These conversations happen whether or not the player is present to hear them, and characters are revealed in bits and pieces that don't always seem to fit together. The newspaper in the salon car is jammed with lengthy, contemporary articles regarding the impending war and other obsessions of the moment. Although the player knows that the First World War is mere days away, it's striking to see the varying degrees to which the passengers and personnel aboard the train are preoccupied or oblivious to the seriousness of the crisis. 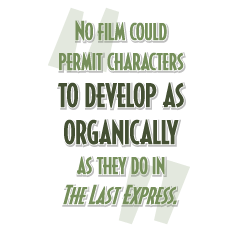 No film could permit characters to develop so organically, and neither film nor literature could create the same feeling of presence that a player gets from seeing the Orient Express through the eyes of the game's protagonist. A typical videogame, on the other hand, asks gamers to explore and navigate level maps, but not people. The Last Express takes one of gaming's signature elements, exploration, and applies it to character and history. This only works, however, because there are actors, writers and artists who created characters deep enough to warrant such exploration.